Happy Friday to you! 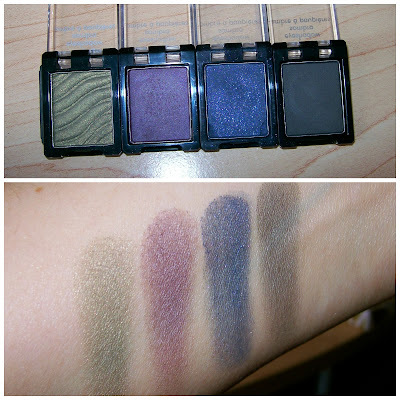 Earlier this week, I did a review on Beauty Broadcast Express about the new Revlon Colorstay Shadowlinks. From the four that I tried, I wasn't too impressed with their color payoff. Some weren't even that great applied on top of a primer. Here's that video- in case you missed it and want to learn more! 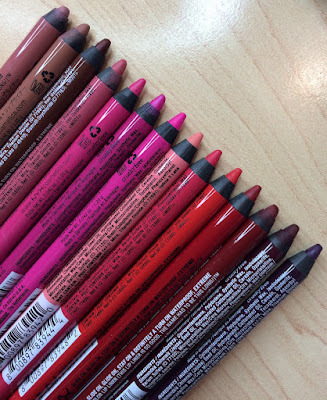 The Revlon ShadowLinks sell for $2.99 each (I got mine from Walgreens), and I had mentioned that the Sally Girl Eyeshadows from Sally Beauty Supply are .99 apiece (.94 if you have the Beauty Club Card), so many of you asked for some more details on those. You can check them out on the Sally Beauty Supply website, and there is a pretty vast shade selection... 48 shades to be exact! I haven't loved every shade I've tried, but as a whole, they seem to perform much better than the Revlon Shadow links... a pleasant surprise since they're a third of the price! One thing to note- these are just a tad bit smaller than Revlon's... the Revlon singles are .05 oz, and Sally's are .04 oz. 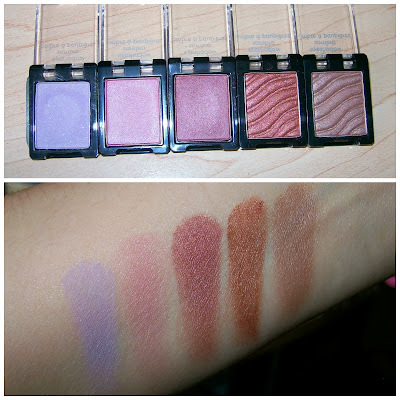 Here are the shades I have, and they interlock in the very same way that Revlon's do. For the purpose of this post, I divided my shadows into light, medium, and deep color categories. You may notice that some of these shadows have a wavy imprint... those are the ones that I've purchased more recently. 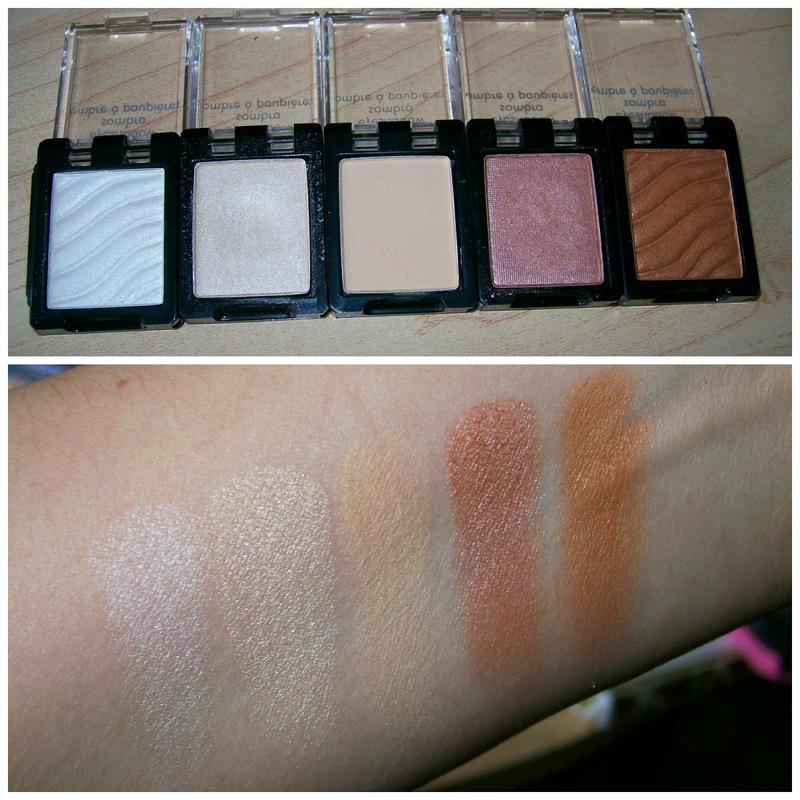 I picked up a couple that were the same as older shades so I could compare and see if the formula had changed. As far as feel and application, they seem to be exactly the same, and you're not getting any less (or more) product because of the imprint. Likes: Copper. This shade is nicely pigmented, but I think I'd wear it more if it were a deeper rust color. Not a bad one, just personal preference. Dislikes: Snow (shimmery white)- much less smooth & rich compared to Champagne. 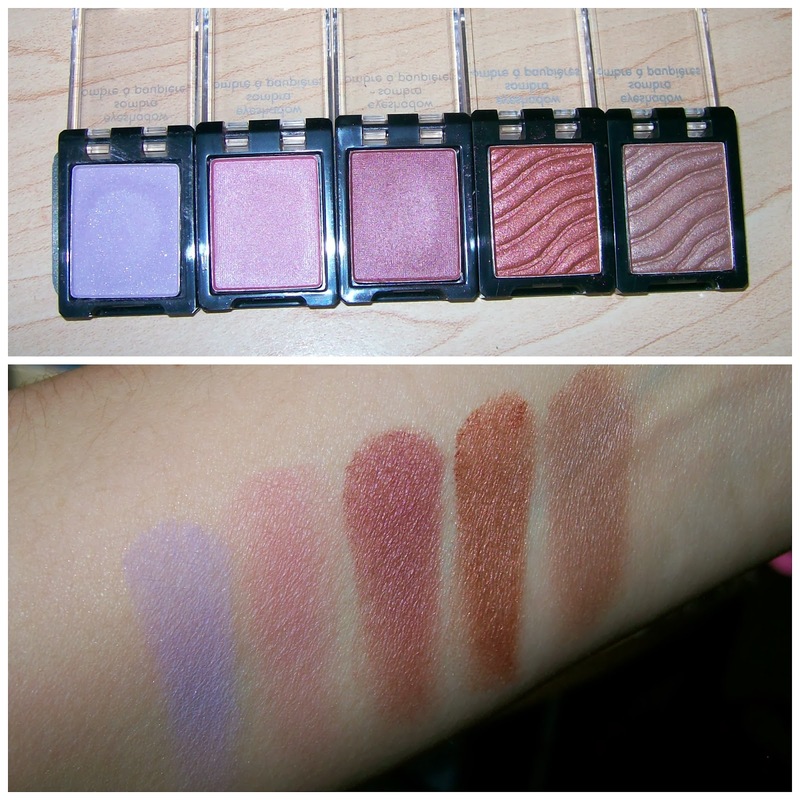 Loves: Cranberry (berry shimmer), Brick (rust shimmer). These shades are gorgeous. Absolutely beautiful and they have a fabulously creamy texture. Likes: Lilac (matte lilac with sparkle). Another personal preference thing. 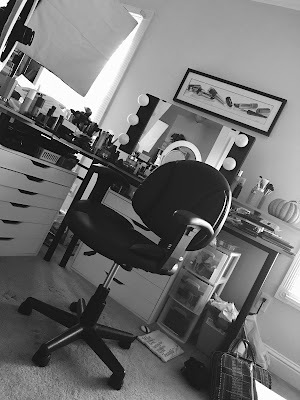 It's a good quality shade, but I've had it for awhile and just haven't used it much. Dislikes: Rose (light shimmery pink) and Espresso (shimmery brown-ish taupe). These shades just seem like a totally different texture than the other shimmers. Not sure what they deal is, but the color payoff isn't very good. Loves: Navy (deep blue with sparkle) - great saturated color, really nice. Likes: Olive (golden army green), Eggplant (deep purple). Olive and Eggplant are both pretty shades, but I wish they had a little more richness. Dislikes: Onyx (matte dark grey)- This range of eyeshadows doesn't have a ton of super dark shades, so I really wished Onyx would turn out to be a rich black... instead it's a standard grey. I would've done a review video on these, but I have so many different colors, I thought a blog post would just be easier. These shades were all swatched without a primer. What's interesting is that even the shades that I "dislike" out of this bunch are better than several of the Revlon ShadowLinks that I used. I would highly recommend my "loves" though! :) I think it's great to see that you can round-up some good quality shadows for a really low price! Have you experimented with the Sally Girl shadows yet? What do you think about them? Big storms last night in our area meant trick-or-treating was cancelled. I think it's happening tonight instead. I'm very excited about a video coming to my main channel tomorrow-- if you've ever wanted a full-coverage face routine that still looks radiant and is 100% drugstore... I have a solution to offer! Meanwhile- today's Express review is by Tyler- and it's on Downy Unstopables. You just never know with that guy! HAVE A GREAT WEEKEND! And don't forget to turn your clocks back on Saturday night! I might have to check these out next time I'm at Sally's. I've heard that the Revlon ones aren't that impressive, but these look like a good alternative. Thanks for sharing Emily! I will definitely go check these out!! Love Olive, Cranberry, Brick, Champagne, Beige, Cinnamon :) Plus for .99, I think the price is awesome! :D Thanks Em, great post! I have used the Sally Girl Olive for years. Now can't find it. Hard to find matte. Old ladies don't need sparkle in their eye creases!!! Very nive post and also very nice Eyeshadows.Thank you!!! I just bought some of these today! I'm excited to try these out tomorrow! As always, great review! Thank you thank you thank you Tyler for the laundry recommendation. I went out and bought some Sunday and haven't stopped smelling my clothing since. So refreshing. I have a recommendation for you guys. My favorite product of all time is Dr. Teal's Eucalyptus Spearming Body Wash. Great for days when you feel a little stuffy. Wow -- I've seen these at Sally's before but never knew they linked together! They should advertise that feature. I've also heard from "Nouveau Cheap" that the Brick color is very close to being a dupe for a MAC shade (I'm recalling this from several months ago, so I might be off a tad). good are grouped. Grouped Decorations are unlocked in succession and take up only one slot. According to All Snapchat Trophies great. good are grouped. Grouped Decorations are unlocked in succession and take up only one slot. According to All Snapchat Trophies nice. Did you know they are DISCONTINUING these?? WAAAHHHH! Need to comply with to Login LiteBlue site. liteblue in information. The USPS LiteBlue services. You could see a red box around the video screen netflixlogin as well as a blue bar on the bottom of the application. Discover card login details should be simple to keep in mind yet difficult to think. visit this site Thanks for reading our tutorial on How to Discover Charge Card Login.